Hair: It’s a natural part of being a human. But when the hair sheds, and skin is exposed, it’s one of those things that a good many of us want to control. Here, we’re tackling hairlessness, what to do when you are losing your hair, and how to naturally reverse hair loss without breaking the bank or undergoing painful hair surgery or hair transplantation. Having a fuller head of hair in most cultures is associated with perceived attractiveness, youth, and an appearance of general well-being. Worldwide, people spend billions of dollars on shampoos, hair products, hair grooming, and last but not least, hair loss products and surgical services. The U.S. estimates that each consumer spent $83.07 on hair care products in 2016. An average woman will drop $55,000 in a lifetime on hair products and treatments, and women generally spend more than men. Since the grind of hair loss is typically unending, it’s important to start treatment as soon as your hairline starts bothering you. Hair Loss or “Alopecia” describes thinning or loss of hair. 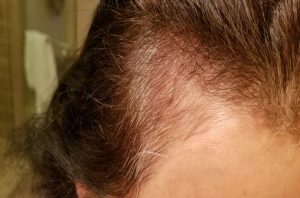 Alopecia may be caused by a number of factors including internal illnesses (low thyroid, autoimmune conditions), or deficiencies in iron, vitamins and minerals including vitamin D, zinc, and other essential hormones. Best practices in hair regrowth includes a battery of lab tests ordered at your consultation, before starting regrowth therapy. The most natural or holistic hair regrowth programs use “photobiomodulation” which is a combination of light and low level laser therapies including Excimer lasers. Under normal conditions, scalp hairs live for about three years (the anagen, or growing, phase); they then enter the telogen, or resting, phase. During the three-month telogen period, the hair root shrivels up into a small “club,” then the hair falls out. It is therefore normal to lose about 100 hairs every day, more of them on days when shampooing loosens the hairs that are ready to fall out. The body then replaces the hairs. Several circumstances produce a “shock to the system” that alters the hair growth rhythm. As a result, as much as 30%-40% of the hairs can cycle into telogen. 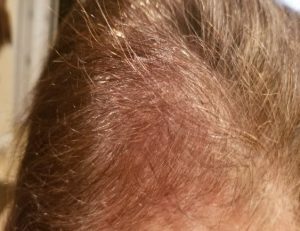 Three months later, hairs come out in a massive shedding (effluvium), especially near the front of the scalp. Sometimes people who worry about losing their hair start noticing hairs on their pillow or in the sink, not realizing that they’ve always been there. A close look at these will usually reveal the club at the end, showing that these hairs shed normally. Normally, about 10% of scalp hairs are in the telogen phase. New, safe, and totally painless laser therapies called Excimer Laser ( 308 nm) and Low Level Laser Therapy (LLLT) are readily available to advance the hairline, and capture those falling hairs. Often patients will first notice a decrease in loss of hair, and next regrowth. The first phase of therapy is called Regrowth, and the second phase called the Maintenance mode. While not everyone responds the same to hair therapies, excimer laser has been exceptional in many individuals with rapid hair regrowth. 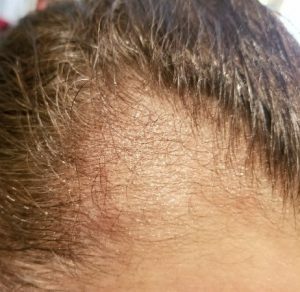 Whereas hair transplants and surgical hair line advancement can cost upwards of $8000-$10,000, these new non-invasive and safe laser regrowth therapies average $50 to $250 per session. On average you may have anywhere from 2 to 25 laser treatments for regrowth, and the maintain with monthly or bimonthly touch ups. Excimer laser is very safe, fast, and completely painless. Most treatments take less than 2 to 3 minutes. There are no needles or anesthetics required. Hence, even a small child could easily have excimer laser or LLLT and feel nothing. Information in this publication and site is not intended to serve as medical advice. Individuals may use the information as a guide to discuss their treatments with their own physicians. This site does not promote nor endorse the unauthorized practice of medicine by non-physicians or state licensed health care providers. Medicine is a constantly changing science and not all therapies are clearly established. New research changes drug and treatment therapies daily. The authors, editors, and publisher of these articles have used their best efforts to provide information that is up-to-date and accurate and is generally accepted within medical standards at the time of publication. However, as medical science is constantly changing and human error is always possible, the authors, editors, and publisher or any other party involved with the publication of this article do not warrant the information in this article is accurate or complete, nor are they responsible for omissions or errors in the article or for the results of using this information. The reader should confirm the information in this article from other sources prior to use. In particular, all drug doses, indications, and contraindications should be confirmed in the package insert.